Proven Winners Does It For YOU! As I sat at my couch-desk this morning, a movement caught my left eye - something was going on just outside the south window. A lot goes on outside that window on a regular basis, mostly of the bird nature, since that's where our main feeder is located. But the feeder was unoccupied. There was a cat about. I got up to investigate further and those smart birds were well up into the trees and though no cats can get to the feeder, the birds weren't taking any chances. Lily was patrolling the south lawn and she'd found something. I hesitate to say just what the something was, because I didn't get a close enough look at it. "It looks like a mouse..."
I knew it wasn't a mouse, but determining whether it was a mole, a vole, or a shrew was something I wasn't qualified to do. I know the difference, but without a closer look, I couldn't know for sure. So for now, we'll just say it was a Not-Mouse. "It moves like a mouse..."
We have all four animals here in Ohio. We know we've got mice. That goes without saying. 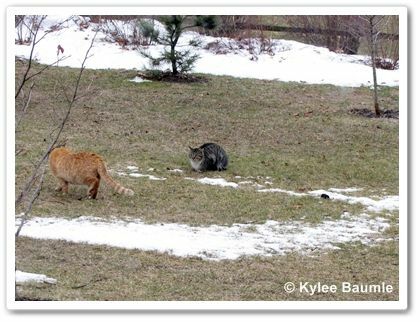 But according to wildlife expert Tim Burton, Ohio has five species of shrew, three of mole, and four of vole. And while you might think they're all pretty much the same, they're not. The mole is 5-7 inches long, black, tunnels underground and rarely leaves their tunnels. They eat earthworms, grubs and beetles. They have wide front feet, made for digging. Slightly larger than moles, voles can be very troublesome in the garden. They eat bulbs, tubers, grasses and herbaceous plants. They make tunnels, too, but they also will make use of the moles' tunnels and will eat roots of your plants. They'll eat bark off the trees and can kill young saplings by girdling them with their gnawing. 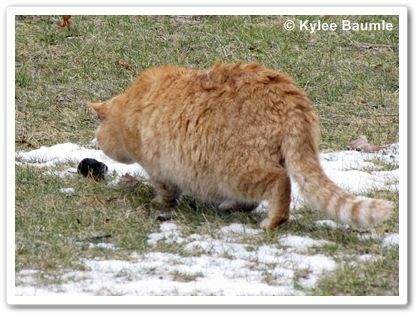 Voles are black, gray, or brown and have a shorter tail than a mouse. 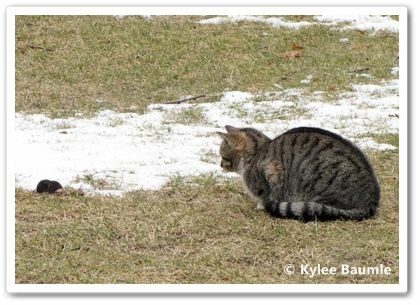 Do NOT use poisons to control voles, because other animals can be poisoned when eating voles, such as dogs and cats, which both find voles to be tasty. Shrews are smaller than moles and voles, being 4-5 inches long. They have a pointy snout, and a short tail like the vole. They are insectivores and are not considered to be harmful to the garden. They can be seen foraging above ground in search of food (nuts, insects, and worms), unlike moles and voles, which tend to stay underground. They do resemble pointy-nosed mice, but aren't even related to mice and aren't rodents, as mice are. 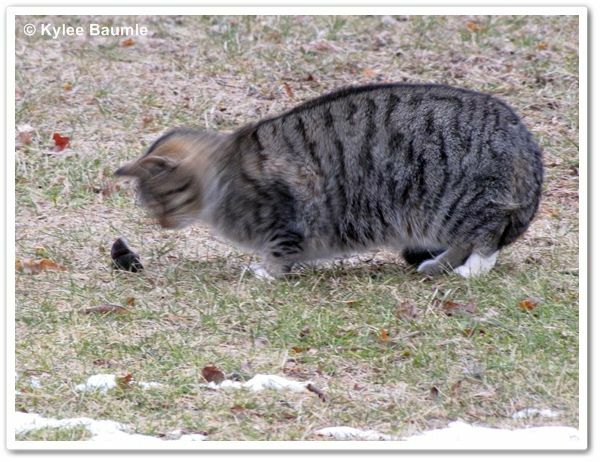 Shrews are not tasty to cats, although they will play with them and chase them. In fact, many shrews contain a toxin that can prove to be fatal to some animals that eat them or those that are bitten by them. They also emit an odor that may warn predators to stay away. 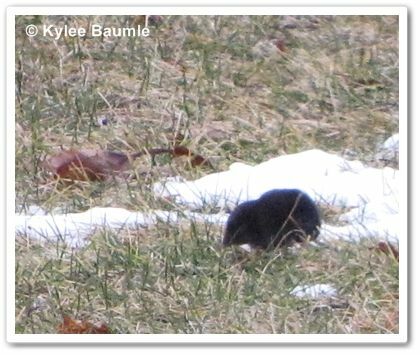 And now that I've done this bit of research about moles and voles and shrews, I'd bet my buttons that the one we saw today was a shrew. It had a pointy nose, and seemed to be frantically looking for something in the grass. 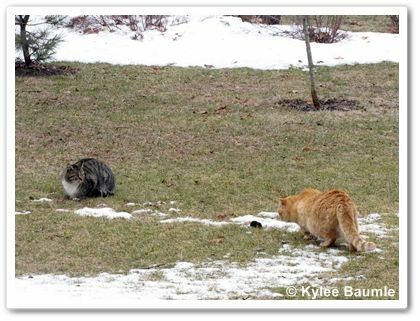 Perhaps the most telling factor was that the cats were hesitant to get close to it, and the few times they did, they jumped back as if the Not-Mouse tried to bite them. 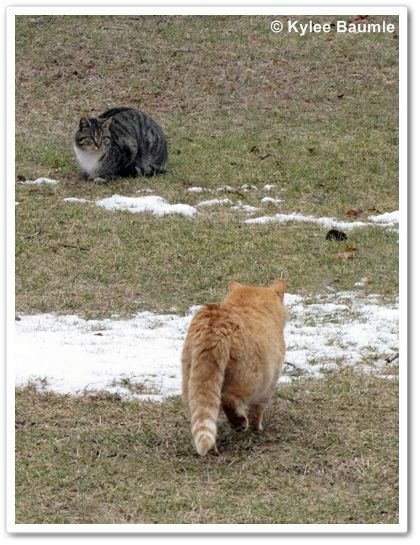 After about 15 minutes of watching the Not-Mouse run around, both Lily and Sam lost interest and walked away. 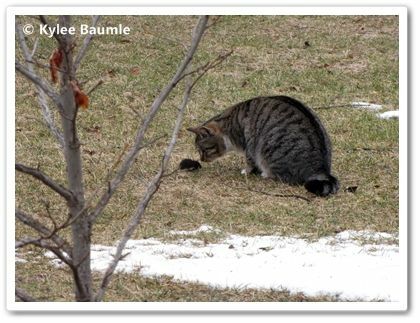 The Not-Mouse continued about its business of rooting around in the grass. I lost interest, too. "Looks like a mouse, don't it, Sam?" "Do you smell it, too?" "I told you it wasn't no mouse!" The taming of the shrew? I think it was the shrew that was doing the taming today. "Now where did that beetle run off to..."
I didn't know that about shrews. Must have been since the cats didn't want to tackle it. Cute post. What fun. Our cats don't seem interested in mice or shrews. And i learned while being entertained! Lisa ~ Prior to this, I didn't know that about shrews either! I didn't even know we had them here! I know we've seen them many times, but I didn't realize that's what they were. I never got close enough to know. Commonweeder ~ Really? 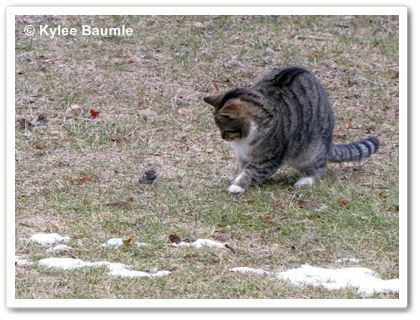 Our cats get mice on a regular basis and we've seen them with voles, too. But we've seen some that have been left for dead and I would imagine those were the shrews. I don't recall ever seeing a mole. Julie ~ The mole has a funny snout too, but not pointy. And they're larger. 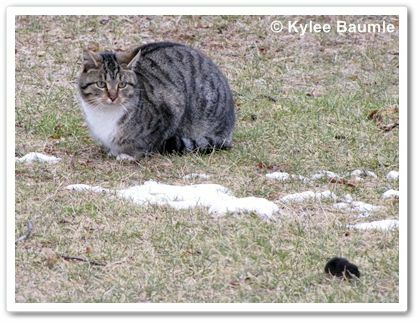 The shrews are likely out and about because it's almost SPRING!!! !